You can reveal this card in your hand; your opponent randomly choses 1 card from your entire hand, then you discard the chosen card. Then, if the discarded card was not “Danger! Ogopogo!”; Special Summon 1 “Danger! Ogopogo!” from your hand, and if you do, draw 1 card. 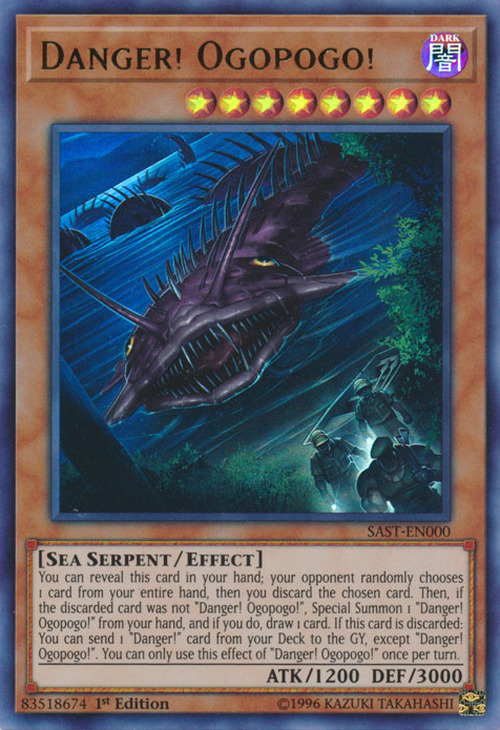 If this card is discarded: You can send 1 “Danger!” card from your Deck to the GY, except “Danger! Ogopogo!”. You can only use this effect of “Danger! Ogopogo!” once per turn.